What are the must have characteristics that a gaming mouse should own? 1. What do you consider to be the most important feature on a gaming mouse? Welcome to Tt eSPORTS Community and here is the gaming mouse poll. What do you consider to be the most important features? With gamers all have different needs and desires. What are the must have features that a gaming mouse should contain since some users do not even notice the difference, but others might claim it makes a huge plus. Please feel free to share us with your ideas and thoughts. If you pick others as your option, be sure to make it clearer to us, thank you. Sensor! No point in having a comfy mouse if the sensor is crap! It's all about comfort of the grip for me. Considering that most mice nowadays have advanced sensors/high dpi/plenty of butttons (which btw is not always convinient to use). So choice is not that hard as it seems - I just have to pick the best combination of shape and grip type. p.s. currently use Razer Copperhead. Nowadays we use mouse often for hours to a day long. Comfort of the grip and Ergonomic shape are most important elements for a long lasting mouse. Ergonomics is first for me. Which not only includes comfort but ease of button use. My usual gripe with gaming mice is the terrible location for the sensitivity buttons. A game like Tribes can require you to constantly switch between sensitivities if you're playing as a sniper. Price, For me it's about $30 tops for a mouse seeing that I don't need premium gimmicks and features for anything above that. At least 2 Side Buttons are near essential for me, driver software and tilt wheels aren't crucial but have been one of the reasons I like the Logitech M510 I have (Not a gaming mouse, but it'll work more than well for me at the moment since I needed a new mouse at that time and Walmart didn't have squat for mice otherwise). This can also apply to plenty of other things outside of mice let alone peripherals. For me, I don't use Programmable buttons often even I do play games a lot. Also, I pay attention on the coating of the mouse since I prefer smooth touch. Price, For me it's about $30 tops for a mouse seeing that I don't need premium gimmicks and features for anything above that. Drivers and a Tilt wheel aren't crucial but have been one of the reasons I like the Logitech M510 I have (Not a gaming mouse, but it'll work more than well for me at the moment since I needed a new mouse at that time and Walmart didn't have squat for mice otherwise). Below information could be a good option for you based on your priority of choosing a gaming mouse. Tt eSPORTS TALON and TALON Blu optical gaming mice are now launched first with NewEgg.com (USA only) for Pre-Order with a MSRP of $19.99 USD. Has to be shape as if it doesn't give you ultimate comfort, nothing else matters after. 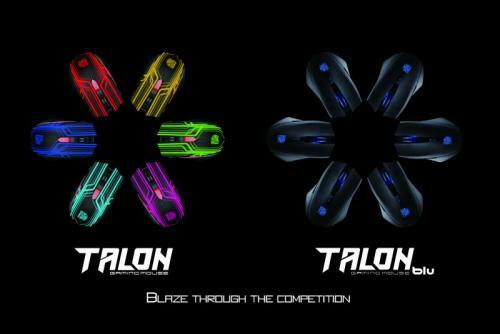 TALON and TALON Blu are going to be a great deal of budget conscious and well-made gaming mice for sure. I think sometimes brand awareness and popularity depends on regions, for example, ROCCAT and SteelSeries are quite famous gaming brands in Europe. Seems the ergonomics wins hands down! Product name is also important too right? Just imagine if Tt eSports released a mouse named "Flaming Destroyer!" or "DPI Flash"
Your friend might ask you "what mouse do you use?" and you enthusiastically reply with " The TteSports FLAMING DESTROYER!!" Eh......yes, but it can also corrupt the brand. There are plenty of brands out there that make a good product, and overcharge you out the wah-zoo for them *cough cough CORSAIR*. Case in point - How many people buy the Dominator Platinum RAM, because of the brand, when G.SKILL Trident X is an outstanding RAM, speed and timings identical, and costs 1/3 less? I'm not trying to bash any brand, but, quality comes first, brand comes later. I know I favor Tt products, and there are multiple reasons for that, and most of my build is done by Tt, but, honestly, not all. Tt will be one of the first companies I look at when researching a product for purchase, but I won't buy something just because it says Tt on it. i use to use Logitech's mouses. Looked great, felt great and also liked the brand named. I used 2 of their flagship mouse models, one for my desktop and a smaller one for my laptop. Both broke within a year. VERY disappointed considering the price paid. for me it is the forma, it must be adapted as much as possible to the morphology of the hand to be comfortable, the sensor is also important but most mice have advanced sensors.